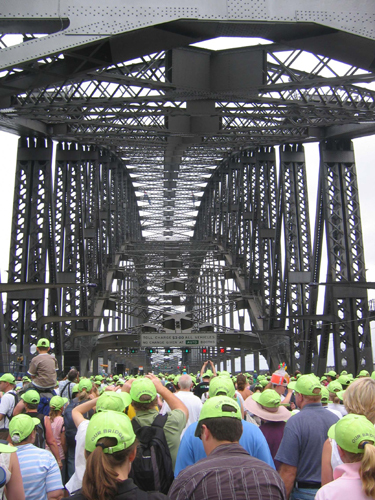 Pix have been added for Sydney's 75th Anniversary of the Harbour Bridge. Here's a pic from my Canon Powershot A80. It's currently what I use. It has served me well but I'm in the market for something better. I still enjoyed playing with the A80's features but there are limits on what you can do with just a point and shoot. This was my attempt at playing with the macro feature, low light, a greeting card and a nervous mouse. Note- cat photo comes from photographer David McEnery called "Cat Nap II". As it usually happens, whenever a VIP visit is planned for a foriegn country there's a myriad of planning that goes into effect. Some of it's chaos, some of it's routine, and some of it is just alot of diplomatic patience that both governments must show each other. I'm far enough back on the sidelines that I don't see as much last minute changes or problems when they happen. There's always another level of respect I give our host country's local staff during and after such trips by American politicans. Without the Australian men and women I work with, things like the recent Vice President Cheney's visit to Sydney would not happen smoothly or probably not happen at all. I didn't make it to the Sydney Dogs Home this weekend, but I'm trying to work out some flex hours to do it during the weekdays. Everyone volunteers anyway for Saturday and it's needed more during the week. I had a good excuse though, I spent all day Saturday making the last day in Sydney for a new friend as entertaining as possible. It's bittersweet though, cuz in the turn of 24 hours we met and then they were on their way out of Sydney. But you learn to enjoy those time regardless. It's part of the Foreign Service life and how you deal with the transient lifestyle of everyone around you. Here's some photos from "Pancake Day" on Feb 20th. It was celebrated across Australia, in order to raise funds for Australians in need. UnitingCare put on a pancake race in Hyde Park and I volunteered with some of the staff to represent the U.S. Consulate in Sydney.